Roughly a year ago when I was initially writing my Canada's Food Guide to Unhealthy Eating series, I had a post detailing why the food guide matters. I noted that not for one second do I think that Canadians put the Food Guide on their fridges or lug the ridiculously over sized 6 page document with them to the Supermarkets but rather that the Food Guide becomes Canada's nutritional backdrop. Last week provided a stunning example. The report is a brick. 517 pages long and it involved 9 independent teams of global scientists, hundreds of peer reviewers, 21 internationally renowned experts, and 5 years of time for them to review and analyze more than 7,000 large scale studies for the effects of diet on cancer. Among their many conclusions was that red meat consumption is not very good for you. In fact they concluded that every 48 grams of processed meat consumed per day boosts the risk of colon cancer by 21 per cent and every 48 grams of red meat consumption beyond a weekly limit of 500grams increases colon cancer risk by 15 per cent. Not surprisingly Big Meat was not happy with this report. 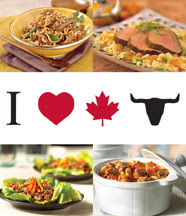 "Eating Well with Canada's Food Guide continues to recognize red meat in the diet. The Food Guide recommends 1 to 3 servings of Meat & Alternatives per day"
"The Beef Information Centre has many resources that can help Canadians continue to make beef a part of a healthy eating pattern, in keeping with Canada's Food Guide." Way to go Health Canada - once again, you've earned the moniker, Happy Corporations. Oh, and still no word back from the Heart and Stroke Foundation. Tomorrow will revisit the Heart and Stroke Foundation and their take on beef in explaining why Health Check matters.